Designed to significantly increase the Omega 3 fatty acid intake. Also contains Omega 6 fatty acid plus vitamins A, C & E which are important for maintenance of healthy skin and coat in dogs and cats. Below are some recent questions we've received regarding Omega Aid, including answers from our team. Where is the Omega's derived? I'm looking for 'from fish' NOT plants! I can confirm the Omega is from fish and not plants. Would this product be ok to use for my 18yr old dog who has kidney failure? I am feeding my 18 yr old dog who has kidney problems, a home cooked diet and would like to add some supplements,& vitamins. Are there some that you could recommend ? Also would it be ok to use Omega Aid ? Beaphar top 10 vitamins is a popular choice and contains many of the essential vitamins and minerals your dog needs. It would be ok to give Omega Aid also but this supplement contains Vitamins A,C and E which is already present in the Beaphar vitamin supplement so ideally you would use something containing only Omegas such as Dorwest Omega Star. Would this omega aid supplement be ok to give to an elderly 18 yr old cat who suffers from a liver problem ... I need to ask, because I have been told to be careful about fat content. I was advised not to give any Omega 6 ... that is derived from olive oil because of the high fat content and vitamin A. Do you do an Omega 3 supplement on its own, or if not, do you think that your Omega Aid should be safe for me to administer to my old girl? I have ordered Senilife earlier today from you, because also, in addition to her liver problem, she's experiencing reduced cognitative function, so do you think giving omega aid also would be too much? I look forward to your reply. I would be unsure about giving Omega Aid to your elderly cat with liver problems. I suppose a very small amount would do no harm, but I would not suggest it. I would ideally offer a liver support type diet and perhaps one of the liver support supplements such as Hepatosyl. 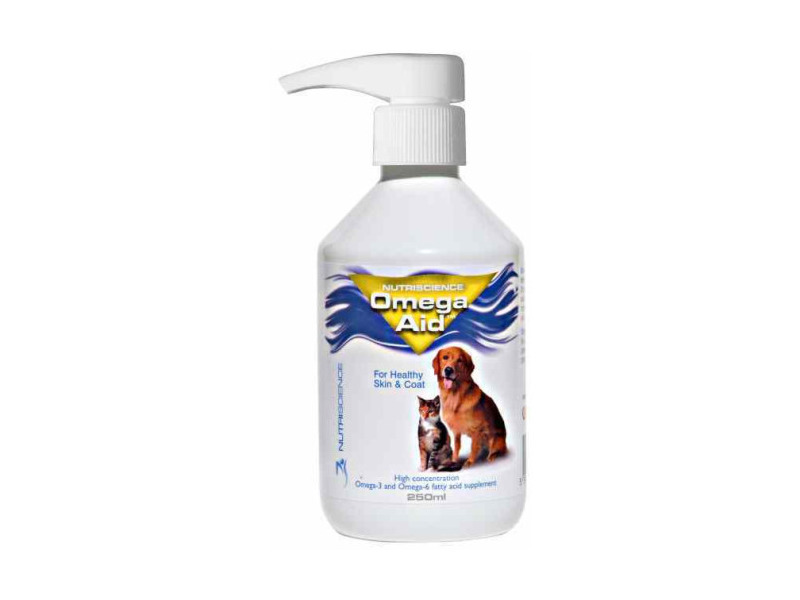 Can omega aid help dogs with atopic dermatitis? Omega aid contains many ingredients that are essential for a healthy skin and coat. It would be a useful addition for any type of dermatitis as it will almost certainly help the skin feel more comfortable. It can be used a long with all medication without any problems.